From January 26, 2009 – January 25, 2013, he was Obama’s Treasury Secretary. He and Fed chairman Bernanke engineered crisis conditions. Bankers profited hugely. They still do. Ordinary people were scammed. Geithner’s gone. His legacy speaks for itself. His background showed what to expect. He spent three years at Kissinger Associates. From 1988 – 2002, he held various Treasury posts. He left to become Council on Foreign Relations international economics department senior fellow. From 2001 – 2003, he was IMF Policy Development and Review director. He left to become New York Fed president. He partnered with Treasury Secretary Hank Paulson and Bernanke. They planned the grandest of grand thefts. They implemented banker bailouts. They looted the federal treasury. They stuck taxpayers with the bill. They debased the currency. They transformed America into an unprecedented money making racket. As New York Federal Reserve Bank president/vice chairman of the Fed Open Market Committee (FOMC), Geithner helped engineer crisis conditions. As Treasury Secretary, he exacerbated them. He turned them into a protracted mainstream depression. Economic and social inequality followed. Indebtedness “skyrocketed.” Everything that happened was planned. Robbing poor Peter to pay rich Paul became policy. Geithner and Bernake bear full responsibility. They partnered in crime. Neil Barofsky was Troubled Asset Relief Program (TARP) watchdog. He served as SIGTARP (Special Inspector General for TARP). In July 2009, he estimated the initial $700 billion bailout could balloon to $23.7 trillion. He said Obama administration secrecy concealed what’s essential to reveal. Trillions were stolen. From $9 to $14 trillion is known. Estimates range to multiples that amount. Corrupt bureaucrats and crooked bankers alone know how much. Five major ones matter most: JP Morgan Chase, Bank of America, Citibank, Goldman Sachs and Wells Fargo. They reflect more than too big to fail. What they say goes. They occupy Washington. They run America. They dictate policy. Geithner and Bernanke are crime bosses. They’re complicit in grand theft. They abandoned Main Street for Wall Street. They know where the bodies are buried. They know the harm they caused. Bankers got bailouts. Ordinary people were lied to and scammed. Geithner and Bernanke exceeded the worst of Bush administration policies. Too big to fail became a license to steal. They serve Wall Street giants. They engineered a financial coup d’etat. They created a fraudulent housing and debt bubble. They illegally shifted vast amounts of capital offshore. Privatization became piracy. It was used as pretext to shift government assets to private investors. They did so at below-market prices. At the same time, they moved private liabilities to government. They did it at no cost to private interests. They’re waging war on middle America. They want social societies destroyed. They want banana republics replacing them. Labor is earmarked for destruction. Totalitarian neoliberal rule is planned. Unaccountability is institutionalized. Crisis conditions remain unresolved. Much worse ahead looms. Expect Geithner to return to his ideological roots. He’s heading back to Wall Street. Expect him to cash in for services rendered. Days before he left, he called his bailout scheme doomed to be unpopular. “You look like you’re giving aid to the arsonist,” he said. He claims history will judge him more kindly. He turned reality on its head. He wrecked the economy. He claims he saved it. He didn’t avoid a Great Depression. He caused one. He didn’t save millions of jobs. He destroyed them. He engineered fake financial reform. He capitulated to Wall Street. He avoided real change. He advanced global monetary control. He did it at the expense of fairness. He took advantage of a corrupted system. It’s crisis-prone, unstable, anarchic, ungovernable, and self-destructive. It repeats boom and bust cycles. Crooks run monetary and fiscal policy. Recessions and depressions follow. Ordinary people are hurt most. Bankers and other financial giants profit enormously. Add money laundering to their profit centers. Money power controls America. Policy facilitates grand theft. Too big to fail banks consolidate. They become larger and more powerful. They game the system for profit. They gamble with public money. They wage financial war on humanity. Massive fraud facilitates private gain. Reform is a figure of speech. Last July, New York Fed documents implicated Geithner in rigging Libor (the London Interbank Offered Rate). It’s a fundamental rate-setting benchmark. It’s set daily between UK banks for overnight to 12 month durations. It’s produced for ten currencies with 15 maturities. It represents the London market’s lowest cost of unsecured funding. It’s the primary global short-term rate benchmark. Last summer’s scandal reflected a cesspool of financial fraud. Manipulating the rate up lets banks steal countless billions in inflated loan costs. Downward manipulation deprives states, communities, pension funds, ordinary investors, and retirees of similar amounts from fixed income holdings. 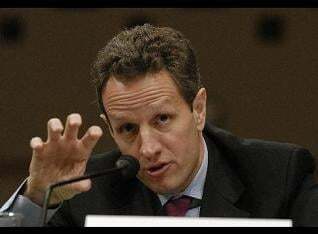 As New York Fed president and Treasury Secretary, Geithner was complicit in fraud. His mandate was to facilitate it. He didn’t disappoint. Instead of fixing a corrupted system, he advanced and exacerbated it. He turned crisis conditions into disaster. He and Bernanke share honors as public enemy number one. They gave away the store to Wall Street. They laid foundational plans for greater grand theft. In real democracies, they’d be in prison. Washington will have to explain why not.